All the talk about about Gov. J.B. Pritzker’s proposed income tax changes is about the rates going up as someone’s income goes up. 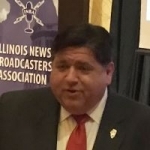 Pritzker says 97% of Illinoisans would pay the same or less. WCMY News asked the governor why he proposes three nearly equal rates just under 5% and then a jump to three nearly equal rates to just under 8%. Part of his answer is that there’s more to it. For example, there are credits to help the middle class. Pritzker says the proposed rates are what they are because they accomplish his goal of raising more money and giving the middle class a break. He spoke at the Illinois News Broadcasters Association convention in Normal over the weekend.